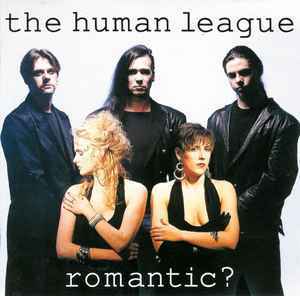 The Human League ‎– Romantic? ℗ 1990 Virgin Records Ltd. © Virgin Records Ltd.
CD states "Manufactured in Austria". Cat# CDV 2624 and 260 984 on booklet and rear insert; cat# CDV2624 on CD label. Jewel case with 8 page booklet. Initial copies has a circular sticker on jewel case stating "INCLUDES THE HIT Heart Like A Wheel CDV 2624". "Romantic?" should have been a return to form - "Heart Like a Wheel" that announced the comeback already sounded like johnny-come-lately in the year 1990, still it had all the perfect ingredients of the group's spot-on hit work (after all, it was Martin Rushent who worked on this particular song). Secondly, judging from the production team the group joined forces with at the time, "Romantic?" really should have delivered - alongside Rushent, there's Mark Brydon, Robert Gordon, William Orbit and Bob Kraushaar but sadly, with "Kiss the Future" (a promising title though), the shot on the very front cover was immediately evident of a group so tired and desperate for creative recovery. But there's still mediocre-to-the-core to come - "Let's Get Together Again" is arranged in the worst of the Eurosong fashion, a cheap electro-contender that would have ended up with zero points regardless. And just when we thought it couldn't get any sadder, along comes "Soundtrack to a Generation". After exposure to this particular song, one cannot help but wondering why the album didn't bear the title "Ironic?". "Get It Right This Time" is actually a rather good a song that would have fitted in better with "Hysteria" (instead of "Don't You Know I Want You") or the "Electric Dreams" soundtrack album - however, on a 1990 album it sounded ever so hopelessly dated (additionally, it very much resembled "Love on the Run" from 1986), despite Martin Rushent's involvement. "Men Are Dreamers" only added to the landslide, a dull and utterly forgettable ballad, where Oakey & Co. were emulating the worst of the omnipresent fifth-rate mainstream pop formula. Some of the songs did get a grip on the League's post-1981 successes; "The Stars Are Going Out" showed some promise, as did "Rebound" - this one is actually the second strongest to "Heart Like a Wheel", slightly darker in tone, radiant with the League's well-known synth-pop charm; both "Heart Like a Wheel" and "Rebound" were cleverly coupled for the single release - and as such, these two remain the only material from "Romantic? ", worth repeated listening. The rest equals a painfully rhetorical question in the album's title.